Eastern slope (right to left is downhill) of the Vallis Schröteri, "Cobra Head." 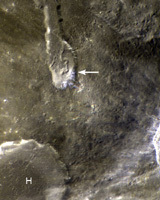 This feature is located in the western portion of a Constellation Program region of interest on the Aristarchus plateau. The slopes of the Cobra Head are boulder-rich and display albedo variations - bright to dark. The patterns of debris and flows on the slopes are evidence for mass-wasting and landslides that expose a variety of rocks. Image width is ~0.5 km, pixel width is 0.51 meters, NAC frame M111918050R.